Macquarie University is a global hub of hearing and hearing-related research, education and engagement. 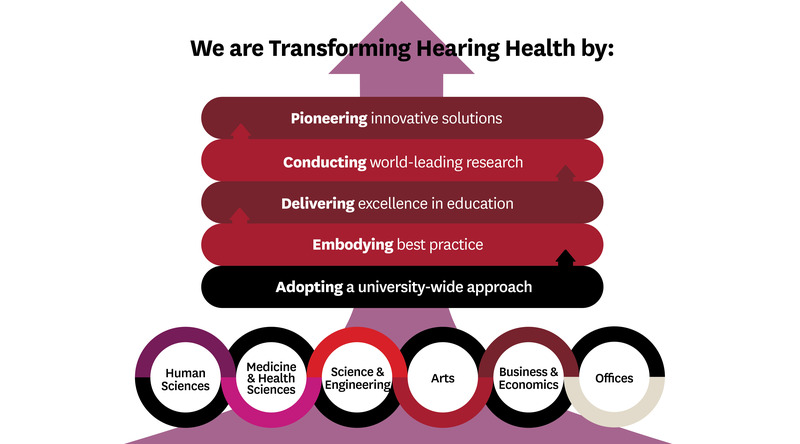 We combine academic strength, clinical expertise, and a visionary approach as we seek to transform hearing health policy and practice and hearing-related endeavours. We connect brain and language sciences with expertise in big data and health systems, machine learning and biomedical engineering to transform our understanding of hearing. We deliver world-class education for clinicians and researchers to transform their understanding of hearing and hearing health, and are working to empower healthcare professionals, individuals and communities to reduce the global burden of hearing loss. Together, we are developing innovative solutions that benefit millions of people living with hearing loss worldwide, and making a difference to our community, Australia, and the world.